1. The absolute, final, no-exceptions registration deadline is this Friday, August 24th, at 11:59 pm MDT. Onsite registration will not be offered for this event. 2. Mikell has updated the One-Cowboy Relay course to have five loops instead of four, but the total distance has only increased from 6.6 km to 6.8 km. One-Cowboy Relay control #82, boulder, 1.3 m, north side, typical open pine forest area. One-Cowboy Relay control #143, reentrant, shallow, overgrown, with wind. 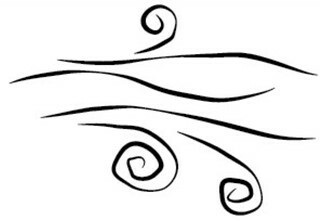 What's the control description symbol for "with wind"? Really that should be "badly overgrown", but so it goes. We don't wish to scare people off.